In previous posts I discussed the Drake Equation (DEq) and the Seager Equation (SEq), and promised to expand those by presenting my own version, the Nastrazzurro Equation (NEq). Let's start with a quick refresher of the DEq and SEq. 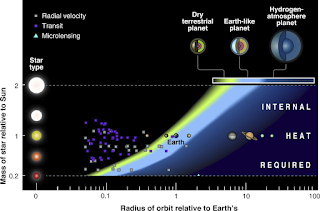 Both provide estimates regarding extraterrestrial life, but in different ways. Frank Drake aimed to estimate the number of intelligent civilizations. Actually, the DEq was aimed at just one particular subset of alien intelligences, meaning those that we should be able to detect on Earth because the aliens in question live nearby and obligingly send out electromagnetic signals into space in very much the same way that we do. Quite a bit of effort is spent listening to the stars to find out whether anyone out there is actually doing that. Writing my post on the DEq strongly influenced my opinion on the matter: I do not expect this method to produce any exciting news anytime soon. The numbers seem to be against it: electromagnetic signals decrease with the square of the distance, so they become very weak even over short distances; short in the astronomical sense, that is. To detect such signals with our current equipment the strength of the signal would have to be ludicrously strong, making you wonder why anyone would want to do so. You may also wonder how long a civilization will keep on transmitting, which is an important factor in the DEq. Apart from the question how long civilizations last in the first place, there is added problem that sending out electromagnetic signals into all directions at once, as we do, seems a bit silly. If the message is meant for people on your own planet or in your own solar system, surely an advanced civilization can somehow direct the signal to where it should go. Sarah Seagers' approach is quite different. Her primary aim is not aim to detect signs of intelligence. Instead, she wishes to study the composition of a planet's atmosphere by seeing how that atmosphere changes the light of the planet's star when it shines through it. 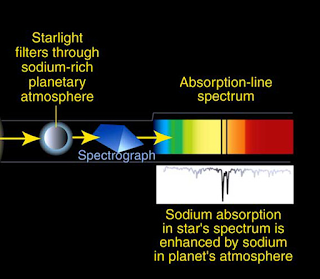 If the atmosphere alters the star's light in a way that suggests metabolic processes, than life is the easiest way of explaining their presence. In other words, does the atmosphere host a biosphere? Just as people are trying to obtain factual evidence of alien radio signals, there will be factual efforts to seek for biospheres in this way. The 'Transiting Exoplanet Survey Satellite' (TESS) was launched in 2018, and will probably find lots of potential planets to investigate later. That 'later' means scrutiny by the James Webb space telescope, not yet launched. Here is some more information on that telescope from NASA. By the way, NASA asked artists and the general public to produce art for the occasion; one of the results is the poster above (here is a link to the art section). The James Webb telescope will apparently launch in 2021, so we might have an answer to the question 'Is there life out there?' within 10 years. National Geographic has some nice information on the search for extraterrestrial life and the methods to find out, right here. Astronaut Bowman looking at the monolith. "Oh my god, it's full of stars!" Anyway, back to the equations: both result in estimates of the number of either civilizations or biospheres that we can detect. And there's the rub: detection! The DEq and SEq aim to obtain factual evidence. And that is precisely the difference with the 'Nastrazzurro Equation' that I propose here. Let me make it clear that I see the NEq as a fanciful thought experiment in science fiction; it is not a competitor of the serious DEq and SEq. If there would be a diminutive of 'Equation', I would use it (it might be 'equationicula', but that sounds as silly as 'equationette'). So what does the somewhat arrogantly named 'Nastrazzurro Equation' actually do? Well, it utterly and completely ignores any wish for actual evidence. That makes it science fiction. Of course, the whole subject of speculative biology is science fiction, even though I like my science 'well done' rather than 'rare'. I like films with alien intelligences in it, especially if these films also betray human intelligence, which is not a given. 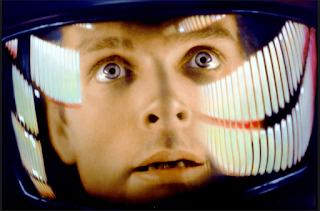 My main interest in all this is alien biology as a whole, and I can do without the intelligence. I would probably have preferred 'Avatar' to be a documentary rather than a drama. Actually, there is such a documentary, but it is only four minutes long. The NEq deals with the question 'How many interesting biologies might there be out there?' At present, I will accept anything as 'interesting', such as a planet with microbial life only, although my interest might become less keen quickly. I would accept with unmoving spongy thingies on the sea floor, spending aeon after aeon doing a spot of quiet filtering. I would love things that jump, move and fly, but for now, any life will do. So: how much life could be out there? Actually, you can use the Drake and Seager equations to answer that question! For instance, take the Drake equation; rather than doing the actual hard work ourselves, let's use the nice program to do the calculations I used before, found here. The image above shows how it works: there are successive boxes in which you can fill in estimates. First, choose an overall setting such as "today's optimistic" and proceed. We can leave the first four estimates as they are. The fifth box asks for the percentage chance that life develops intelligence. We do not care about intelligence and we do not want that box to reduce the estimate, so we simply put in 100 (If we were to use a proper equation, this term would be left out). The next box asks about the percentage chance that life can communicate across space, and we do not want that one either, so we set that to 100% too. We then are asked to fill in the length of time that a civilization actually transmits signals. Here, we do have to fill in a number, but it should represent something else: it should be the length of time a planet harbours life. That's a tricky guess, but the number will certainly be much larger than the time a civilization is transmitting. But we can use actual data! Life has already existed on Earth for 3.7 billion years (3.7x10^9 years), and might exist until the conditions for life cease to exist, which might be in 2-3 billion years, according to Wikipedia. So we can put in 6x10^9 years as an estimate. Unfortunately, you will find that the programme does not accept such large numbers, so for now we just leave the setting at 10 million (10^7) instead of 6x10^9 and remember that the result will later have to be multiplied by 600. The last box asks for the number of times a civilisation can redevelop. Here, we will assume that life needs to evolve only once, so we set that to '0' instead of '3'. 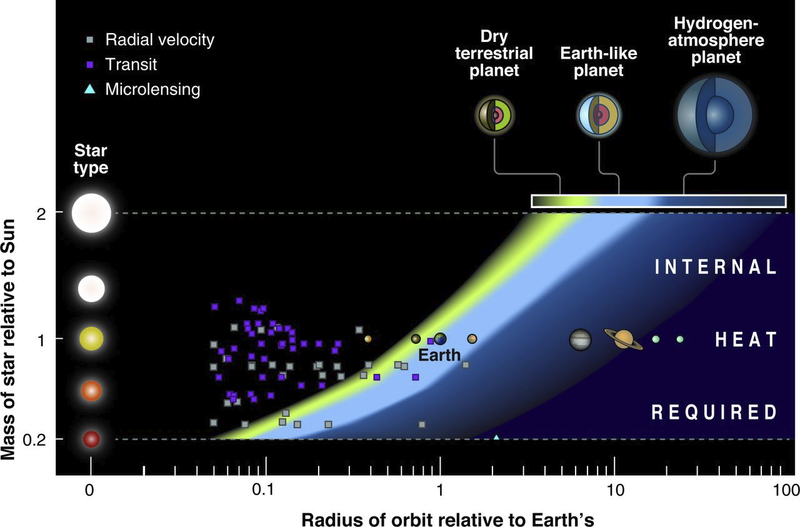 Press calculate and get 18,900,000 planets with life in our galaxy, or, say, 1.9x10^7. We must not forget that the estimate of duration was 600 times too short, so our estimate becomes 11.4x10^9 planets with life in the galaxy. That is 11,400,000,000 planets. Nice! You will get other results, depending on the starting conditions, but the message is clear. But estimates need to be compared to something, so let's compare them to the number of starts in the galaxy. Here is a post by NASA from someone who tried to find out, and the result is 100 to 400 billion. Let's use a nice average of 250 billion, or 2.5x10^11. Our increasingly wobbly NEq tells us that that one in every 22 planets has life. Wow! How about the Seager equation? We can hijack that and turn it into a Nastrazzurro Equation too! Let's go for the "original Seager values". The first box asks us about the number of 'observable red dwarfs'. We do not care about 'observable', and we will also allow for other types of stars. Again, we need an estimate for the number of stars in a galaxy, and we can take the 250 billion estimate again (2.5x10^11). The highest settings seems to be 500,000, so let's remember that our calculation will be 500,000 times too low. The next box asks for minimal disruptions. Let's leave it at the original 20%. The next box concerns the percentage that can be observed. We wish to ignore that, so put it at 100%. Let's leave the estimate for 'rocky planets' as it is, at 15%. Let's set the percentage with life to a low value of 1% as per the original values. The next one is about detectability again, so that becomes 100% for 'omit this box'. We press calculate and get 15,000. That's not very much, but we still had to multiply the number by 500,000. So now we get 7.5x10^9 planets with life. That is one in about 33 planets. Still wow! What I like about all this is that The Nastrazzurro Equation suggests that there is room for something like a 'woolly haired shuffler' somewhere in the galaxy; there is room for rusps too, and spidrids, and, well, all of it. Not so bad for a thought experiment in speculative biology, is it? The Drake equation, discussed recently on this blog, provides an estimate of how many communicating civilisations there are in our galaxy. It does so by multiplying a series of factors; none of these is rock solid, so some say it is basically guesswork. That is true, but in the absence of hard facts an educated guess is the best evidence there is. The nice thing about the Drake equation is that it in essence falsifiable, meaning that it is, at least in theory, possible to say whether there are such civilizations or not. In theory, that is, because one of the two possibilities is that are no such civilizations, and it is usually much harder to prove the absence of something than its presence. If someone in another solar system one day decides to answer our interstellar call, for instance to ask mankind to please turn the volume down, or to stop pestering them with unwanted phone calls in the middle of dinner, then we will know for certain that there is someone out there. But at present we have not received any signal, which tell us precisely nothing. It is like fishing: as long as you haven't caught any fish, you cannot conclude there aren't any. Only when you've caught one can you say that there are fish (or, more precisely, that there was at least one fish; you may just have exterminated the species). Sara Seager, an astronomer at MIT, proposed a different approach. If you Google her you will find many entries, among them her own website. Her reasoning rests something much more basic then intelligent being using radio signals: is there a biosphere? Her idea starts with the concept that life requires liquid water, an concept that certainly holds water (sorry for that one). Liquid water requires a planet in the habitable zone at the right distance from its star. What I learned from an overview of the conditions under which you might get liquid water is that there might even be liquid water on runaway planets that are no longer circling a star. Anyway, take a planet, add life, stir and wait, and you might get a biosphere. It is wise to search for stars with a nice quiet long term behaviour, so the stars do not cook their planets halfway down the line. Lifeforms have metabolisms, and spew out interesting gases that provide a 'biosignature' in the atmosphere around an alien planet. Life on Earth certainly altered the atmosphere. At one point there was a nice community of anaerobic organisms quietly doing their thing, and then some new-fangled intruders called 'plants' starting using a highly polluting process called photosynthesis, with a highly reactive dangerous poison as a by-product: oxygen. Plants may have caused the very first mass extinction. Later on, animals learned to control how to burn stuff slowly with that oxygen, making a dent in the amount of oxygen, but not a large one, so Earth's atmosphere now still consists of 20% oxygen. And that can be measured from afar. Unfortunately, the detection is not easy. The method Seager proposes rests on planets passing exactly through the line of sight from Earth to the planet's star, so they appear to transit the disk of that star. That process works well and has already resulted in the discovery of many exoplanets. The TESS satellite was launched in April of 2018 to find many more. When the planets pass the star, they alter the composition of the star's light, and that change tells you something about the planetary atmosphere. Of course, not all planets happen to pass through that line of sight, so only some are observable this way. There is another problem: many biosignature gases are destroyed by ultraviolet radiation from the star, reducing their amount. 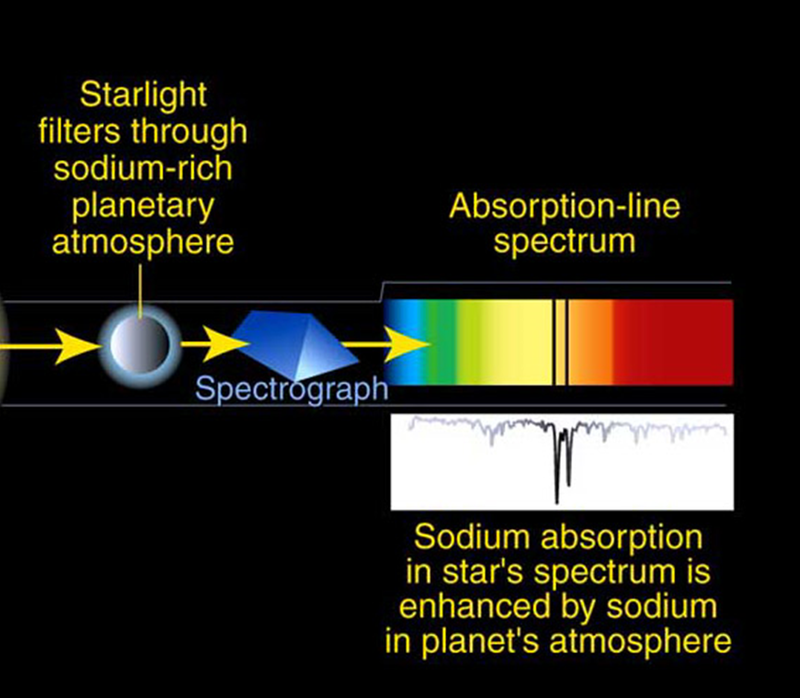 These gases will be easier to detect if they are not broken down by UV, which is why Seager proposes looking at M-type stars (red dwarfs), because that live long and put out little UV. The latter job is to be done by the James Webb satellite, to be launched in 2021 (probably). If you study the parameters, you will see that several factors have to do with the 'detectability' of a biosphere. That holds for the fractions that concern 'quiet stars', 'observable systems' and detectable 'spectroscopic signatures'. Those fractions decrease the total number appreciably. But what is the number? Luckily, there is a very nice website allowing you to play with all the parameters in both the Drake and the Seager Equations, so you can see how they alter the final estimate. The settings shown above are for the "today's optimistic" option. Pressing calculate will give you 750 planets, while the "Seager original values" only give you 0.45 planets. 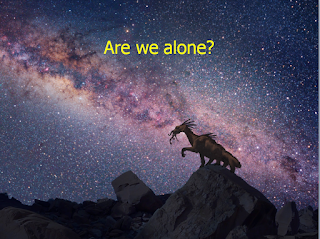 Running the Drake equation with the original settings results in 10 communicating civilizations in our galaxy. Note that the drake and Seager equations rely of completely different detection techniques, that in part explain the differences. Does it matter for speculative biology? Well, you could say that speculative biology has to start with astronomy, so yes. In the last of these 'equation' posts, a forthcoming post on the 'Nastrazurro Equation', I will try to apply all this astronomical reasoning to speculative biology in another way. Soon. Probably. ImagineFX is a Bitish magazine devoted to art in science fiction, fantasy and gaming settings. Its webiste is here, and here is its YouTube channel. Most of the content is about digital painting, but they also discuss 3D applications, a bit of hardware and conventional art. They devote several pages to work sent to them by readers, and so I decided several months ago to try my luck. I sent five images with a bit of text and waited. I wouldn't write this if the result would have been 'Thank you but no'. 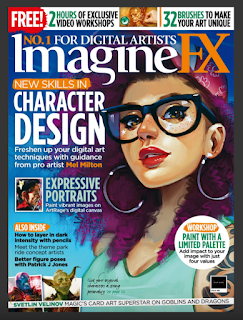 So, some as yet unseen images of Furaha will feature in issue 168 of Imagine FX, that will go on sale in the UK on Friday 2nd November (I think that this is the December issue, by the way). I was informed that that issue will reach the US, Canada and Australia three weeks after that date. I haven't seen the issue yet, so I have no idea whether they will devote one or two pages to my work nor which paintings they selected. I just thought that those of you who absolutely cannot wait, and who live in the UK, might wish to know. The cover is shown above so you will know what to look for. I expect to get my own copy shortly, so I will probably write some more about it before the magazine becomes available beyond the UK. Oh yes; a post on the 'Seager Equation' will appear this weekend, and one on the 'Nastrazzurro Equation' probably two weeks later. I am slowly recuperating from the TetZooCon event in London that took place on last Saturday and Sunday (that's short for 'Tetrapod Zoology Convention'). I had not been to a TetZooCon before, for the simple reason that the timing in October had always interfered with my work: October is a very popular month for all kinds of scientific conventions. But this time I had taken time off in October, and by pure coincidence TetZooCon happened to fall right in that period. I definitely will want to go to next year's TetZooCon. They're fun! I learned about whale population recovery, straight-tusked elephants, the influence of city lights on the biological clocks of birds, music in wildlife documentaries, and many, many other things. I expect that there will be a discussion of the programme on tetzoo.com, so I will not go into details here. I will just hint at one or two things. I was very curious about the Palaeoart workshop. The programme stated talks by Luis Rey and Mark Witton, and there was a discussion in which John Conway and Bob Nicholls also took part. 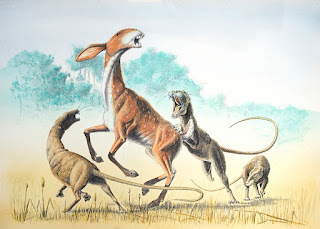 In this blog I have never devoted much attention to palaeoart, although I think it can fall under the heading of 'allied matters' in the title of this blog. 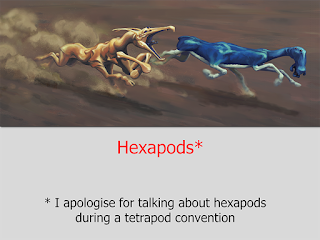 After all, much of palaeoart is speculative, and in that sense it is part of speculative biology. Part of the discussion was about to which extent those who like art in general would also like palaeoart. Personally I doubt that: the admittedly little I have seen of the general art world suggested surprisingly closed minds, with some Art Schools not even deigning tot teach representational art at all. Do not even mention digital painting there; that seems to lie outside that particular micro-universe altogether. 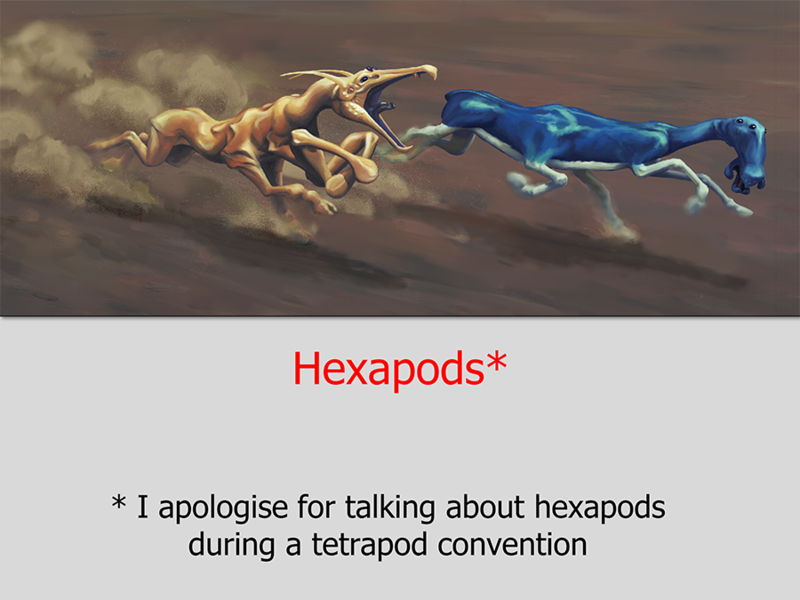 The discussion also dealt with the current preference for photorealism in palaeoart. Some of the photorealistic work done by experts in that field is stunning. But I grew up with the work of people like Zdenek Burian, who worked in a much more impressionist manner. The irony here is that, whenever I aim to do something in a Burian-like style, it always turns out much more photorealistic than I wanted to. That twist brings me to the workshop itself: John Conway asked the participants to produce palaeoart in an art style that would be new and foreign to the artist, challenging people to use materials they were otherwise unfamiliar with. I found that so much of a challenge that I missed the first 10 minutes of Luis Rey's talk altogether (sorry). In the end, I used pastels, even though I stopped touching crayons, charcoal and similar materials as soon as my school teachers allowed me to let them lie. I chose to draw a triceratops in the style used by Stone Age painters, using an Altamira bison as inspiration. The coarse effects of the pastel really fitted the subject matter well, which was more luck than intention. On Sunday afternoon Darren Naish led a discussion about speculative biology, with Dougal Dixon and me as speakers. Dougal was his usual enthusiastic self and did very well. He had brought along a model of Greenworld (for posts on Greenworld see here and here), as well as many sketchbooks of Greenworld, that were laying on a table so everyone had ample time to browse through them during the conference. I showed a 15-slide presentation of Furaha that contained nine paintings that had not been publicly shown before, so I wondered whether people would pick up on those (so far, I haven't seen them pop up yet). Because this was just a quick introduction I did not provide much in the way of background knowledge. Here is a slide of a subject that was published before: it is part of the banner at the top of this blog, but the one here is a reworked digital version, while the one in the banner is still the old oil painting. Hexapods form the last group I need to do to complete The Book, taking up some 10 to 12 spreads. I am thinking of giving them a thorough makeover, with important changes to their jaws and leg structures. The book 'After Man' is arguably the best-known book in Speculative Biology. It first appeared in 1981, so you may well wonder why I should choose to discuss a book everyone knows already, 37 years after its publication. Well, a shiny new edition came out. It is a facsimile edition of the 1981 version, but with some changes. I still own the copy I bought in 1981 and could easily compare the two. The new version faithfully copies the monochrome sections at the beginning and end of the book that explain basic concepts such as the nature of evolution. These, printed on a somewhat coarse type of paper, enclose the heart of the book like slices of bread in a sandwich. That heart consists of 90 pages filled with illustrations in full colour, printed in much better quality on glossy paper. Even the page numbers match up perfectly. The few changes are interesting. The introductory text has been updated in a few places, and these are indicated with a slightly different font, a nice touch for the bibliophiles among us. For instance, the old version states that early amphibians already had 5 toes on each foot, whereas the new version says that that pattern only emerged as the standard pattern after earlier experiments with other numbers. The middle part of the book describes animals using ecological zones as a guiding principle, but Dougal Dixon has made two changes to the illustrations. These were originally done by professional artists and were based on sketches by Dougal. That process was not always easy, as Dougal explained in an interview with Darren Naish. I own some photocopies of early sketches for Greenworld that Dougal was kind enough to send me a long time ago, so I can say with confidence that he knows what he is doing when he sketches animals. I discussed Greenword, still only available in Japanese, here, here and here. Dougal gave me permission to use the drawing above to illustrate his own skills. These are of course predatory descendants of rats (falanxes) attacking a rabbit descendant, the rabbuck. Dougal was generally happy with the illustrators' work, except for two interpretations. In the new book he replaced the drawings of the reed stilt and the night stalker with his own drawings, and they indeed look better, in particular the reed stilt, that now is a lightweight and slender creature. I will not show them here; but leave them as an incentive to buy the book. I could stop here and consider the job done, but I have seen some critical discussions of Dixon's works, including 'After Man'. I sometimes think these criticisms are overly harsh and would like to add a bit of background to 'After Man', meaning the time in which it appeared. Everyone is obviously free to form his or her opinion on the matter, and let me stress that I have my doubts here and there too. As an example, let me discuss the night stalker in some detail. It is a fierce predator, descended from a bat that has given up flight and is a nocturnal terrestrial hunter, using sonar to find its prey. It walks on its front legs and uses its hind legs to catch prey, for which they arch over and outside of the front legs. The image above was copied from the dust cover of the 1981 edition, showing Dougal with a model of the night stalker. Dougal is very good at making such models by the way: I saw several of them for myself on the occasion of the Loncon3 science fiction convention (discussed here by Darren Naish and here by me). Let's follow the scenario of evolving a land-living bat with specialised grasping legs. I would not expect all those features to evolve at once, but that one would set the stage for the next. (Whales did not evolve baleens the minute they entered the water, but had to become proficient swimmers first.) I expect the first step in that process to be that the bat gives up flight and becomes an animal walking on all fours. That will force quick changes to both the front and hind legs. I would expect that freeing one pair of limbs to catch prey and using the other legs to walk on to evolve only after that. (That, by the way, would be an example of 'centaurism'; see earlier posts here and here). Which pair of legs would become grasping limbs? My guess would be the front legs, because they are closer to the prey. But if the hind legs would be used for some reason, would they reach forward on the outside of the front legs, or in between, where the entire hind part of the body might also be swung forward to extend the reach? By now you may feel that all this criticism of what is probably the most famous creation of 'After Man' is a very odd way to defend Dougal's work. But there is a point here: it is very unlikely that anyone would have been able to raise such specific and detailed considerations in 1981. Such a person would at the time have to have been a professional biologist, not a member of the general public. I am not a biologist, and I can only raise such criticisms now because of several reasons. The first is having ideas; even though I thought hard about the use of sonar for a land-living predator, someone had to have to come with that idea first, and that certainly wasn't me; it was Dougal. The second reason is that you need knowledge to think matters through; to learn, there must be something to learn from. On the dinosaur front, you would not be happy. There were stirrings of the coming 'Dinosaur Renaissance' (Bakker's paper from Scientific American from 1975 can be found here). But Robert Bakker's book 'The Dinosaur Heresies', that spread the message that dinosaurs were lively, athletic and interesting was still five years into the future in 1981. The most spectacular book on past life that you could own at the time was probably 'Life before Man', illustrated by Zdenek Burian. It had been around at least since 1973. Speculative biology did not really exist as such. An early work such as Stümpke's 'Snouters' (1957) would remain unknown to you, unless someone book dealer would decide to distribute a new printing, so you could find out about it, by chance, by browsing a book store. I found one in 1983 (under its original German title of 'Bau und Leben der Rhinogradentia'). I later wrote about them here, here and here. That's about it. There was no information at your fingertips. If you wished to learn something from an author, you wrote them a polite letter and hoped for the best. No internet, no Google, no computers (well, except for the Sinclair ZX-81 with a 1Kb memory). The lack of information back then would now feel like a near vacuum, and as a result even the most interested people could not possibly become as well-read as many people on the forums now are. It was in this vacuum that Dougal Dixon used his knowledge of evolution and zoology to come up with not just one odd animal, but a whole book full of them. He in fact largely defined speculative biology with 'After Man'. It was an extraordinarily creative production at the time of its first appearance, and that is the only time to judge originality and creativity. 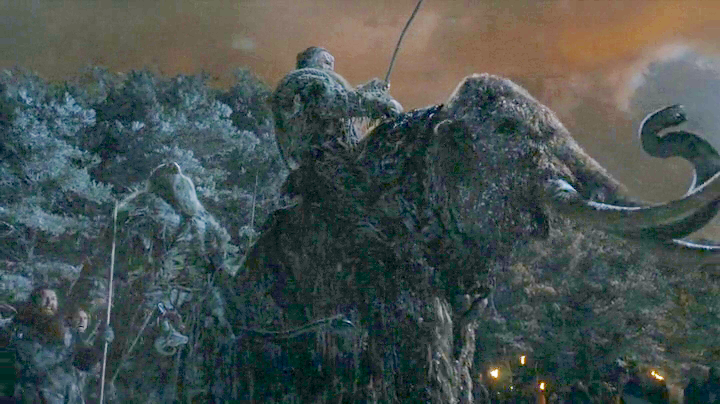 Is it cruel for giants to ride mammoths in Game of Thrones? In season 4, episode 9, of Game of thrones (GoT) there are several scenes of tame mammoths: in one, a mammoth is being ridden by a GoT giant, much as a man would ride a horse. When I saw that scene anew, my mind immediately came up, uninvited and unasked for, with the question whether a mammoth could in fact carry a giant. Is that a silly question? Of course it is, but this entire blog is to a large extent about serious answers to silly questions, so there you are. Unfortunately, an internet search for questions such as 'How many giants can you fit on a mammoth?' did not provide anything useful. That was disappointing, but perhaps publishing this post will change that sad state of affairs. Forced to come up with an answer myself, I divided the problem in parts. 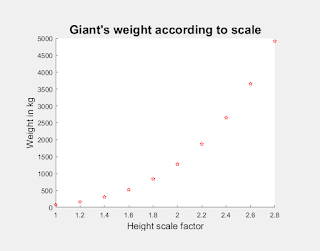 The first asks 'What is the mass and weight of a GoT giant? ', and the second concerns an educated guess at the load-carrying capacity of a mammoth. 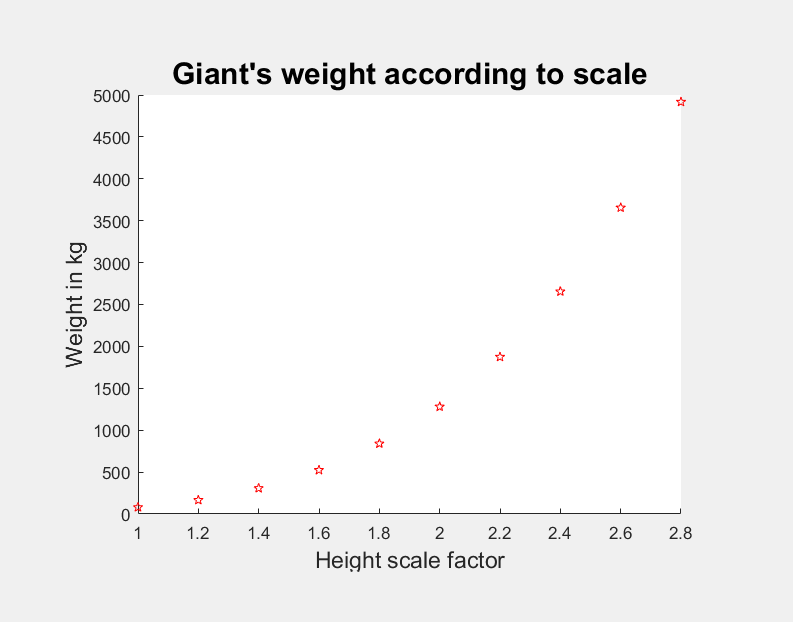 What are the mass and weight of a GoT giant? I had already answered that question in a post built on well-known animal scaling laws, but a later image made me think that the giants were well over twice as tall as a man, so I looked at the question again. The basic principle is simple: if you scale an animal up with a factor x, its weight will by multiplied by the third power of x, but the cross section of its bones is only multiplied by the square of x, not enough to deal with the increased mass. Bones of large animals must be relatively thicker than of small ones. In that post, I scaled the height of a 1.8 m man weighing 80 kg up by a factor 2, but the width and breadth had to be multiplied not by 2 but by 2.8, which I rounded up to 3.0. The giant's weight became 80 x 2 x 3 x 3 = 1440 kg. In the new scene, shown above, the giant certainly seemed more than twice as high as the men around him, but foreshortening made it difficult to be certain. But if you understand perspective a bit you know that you can use vanishing points to put things into, well, perspective. The troops are standing in fairly orderly lines, allowing some lines to vanishing pints and a horizon to be drawn. Vertical lines indicate the height of the giant and a man. Once a man and the giant could be placed on the same set of lines to a vanishing point, the job is nearly done. The height of the man is given by the line AB. Using the perspective lines AB can be projected as A'B' onto the height line of the giant. All that is needed then is to estimate how much taller the giant's is than A'B'. That was about 2.8 times, so if we take a 1.75 m tall man the giant becomes an incredible 4.9 m tall. The range of 2.0 to 2.8 times a man is very large; either my estimates are off, or giants are very variable, or the makers of GoT were not too consistent with their special effects. I suspect the latter; the image at the top suggests that the giant is fairly small relative to the mammoth. Let's pretend otherwise. But my estimate may have been off, so let's also consider height scale factors of 2.0 and 2.4, resulting in masses of 1280 and 2654 kg. Gravity in GoT is probably the same as on Earth, as people move just as they do on Earth, so we step from mass to weight as we do on Earth (meaning without thinking about it). I assume that GoT mammoths are the same size as Earth's woolly mammoths, because I could not find a scene that had mammoths standing conveniently still next to a group of people. Scenes of mammoths with people around them in GoT do not suggest that the mammoths were larger than elephants. I took an excellent scale drawings of extinct elephants, done by the illustrator Mauricio Anton, and put the modified giants next to them. The image was copied from this book. Mr Anton often poses animals next to another, with a background of squared giving the scale. That works very well so I copied the idea, with gratitude, and made a similar image for giants to the same scale as Antón's picture of elephants. Mind you, the left elephant is your prototypical mammth. How much weight can a mammoth carry? The only way I could think of to answer this question was to see how much weight living elephants can carry. African elephants are not very cooperative in this regard, but there are data on Asian elephants. Apparently some people are worried that putting tourists on elephant's back harms the elephants, and I found a detailed defence by a company doing just that, saying that their elephants, with a weight range of 2081 to 5000 kg, carry tourists and gear that together make up 4.9 to 13.0% of their body weight. They also state that elephants can carry up to 25% of their weight without discomfort, but that percentage is based on studies in horses. If you look up the article on 'pack animals' in Wikipedia, you will find numbers for camels, yaks, llamas, mule, horses and reindeer. If you try to compare those with typical weights of these animals, you end up with values of about 20-30% of the animal's weight. My guess is that the percentage should be lower for larger animals, because the safety margin might be smaller, seeing how their own skeletons already make up more and more of their mass as their size increases. So it is probably wise to restrict the load on a mammoth to a maximum of 20 or perhaps 25% of their body mass. Actually, most species of mammoth were only about as large as a modern Asian elephant, and the maximum weight of those is around 5000 kg. Several sources state that the woolly mammoth was about the size of an African elephant, so male 'woollies' must have weighed up to 6000 kg. So we have a 6000 kg big male woolly elephant, and we make it carry 20-25% of its weight, or 1200-1500 kg. Come to think of it, it may be wise to ask the mammoth to do that rather than 'make' it do so. A discontent mammoth might cause all kinds of unpleasantness. Our giants with height scaling factors of 2.0, 2.4 and 2.8 weighed 1280, 2654 and 4917 kg respectively. Obviously, only very small giants should be allowed to ride mammoths ('small giants'??). Putting a really large giant on a mammoth would definitely constitute cruelty to mammoths. This must not be allowed to continue! Mind you, with only one season left for GoT, and with the state of general carnage we have seen so far, all giants may by now have been recruited as soldiers in the army of the dead. Without mincing words, they are all zombified; it's sad, actually. Mammoths may all be zombified too, to the very last calf, which I personally find even sadder. But the good news is that zombified mammoths probably are beyond suffering, so animal welfare concerns probably do not extend to dead mammoths. That's a relief!